There’s a story going around Edisto about a leatherback sea turtle that has been seen on the shores of the beach and over on Pine Island. Grown men have been having their pictures taken next to the turtle on the beach to show its size, which is rumored to be exceptionally large. According to South Carolina’s Department of Natural Resources, an adult leatherback turtle is normally more than 1,000 pounds and the length of its shell is five feet. What’s even more incredible about this turtle being here on Edisto is that it is exceedingly rare for leatherbacks to ever nest in South Carolina, so seeing the turtle on land might denote that the turtle is either injured or ill. In spite of the fact that they do not typically nest here in South Carolina, they do like to feast upon the abundant cannonball jellyfish in the area found in the spring and fall, so small numbers of leatherbacks can be found off the coast. Like many other sea turtles, the leatherback is an endangered species. Leatherbacks were frequently killed for their meat and oil back in the 1990s in the Caribbean. Leatherback eggs were also used for human consumption, but nightly patrols and nest protection programs put into place two decades ago has eliminated this problem. Female leatherbacks will not nest on a beach if furniture or other beach equipment blocks their path. They are also prone to abort nesting attempts if there is too much unnatural light on the beach, which is why outdoor lights are required to be turned off at night on Edisto Beach. If you do happen upon the leatherback sea turtle during the day or night go to http://www.seaturtle.org/istor/map.php to report a sighting. 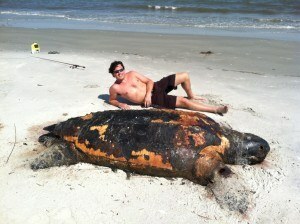 Cheryl, Yes, the photographer was aware that the turtle was deceased. DNR was contacted and did come to inspect the turtle since it was a large specimen. The turtle was tagged in Trinidad and DNR is currently awaiting data from the tag. This turtle appears to be dead, lack of eyes in the sockets? Has someone removed it? How sad, I have been coming to Edisto for years and have never seen one like this. Will keep an eye out.